People with varicose veins should be offered laser or heat treatment, according to new NICE guidelines for England and Wales which say surgery should be a last resort. Up to one third of adults in the UK develop the condition where veins have stopped working properly and begin to swell. Over 35,000 varicose veins procedures were carried out in the NHS last year. Switching from surgery to these newer therapies could save the NHS £400,000 a year in England alone, says NICE. Prof Alun Davies, who helped write the new advice, said: "This guideline shows quite clearly that interventional treatment for some patients who are suffering from symptomatic varicose veins is a better alternative to surgery, and is both clinically and cost-effective. It will help standardise care for all those with this condition." There has been a gradual shift away from surgery in recent years, but many patients are still offered it as the first choice over laser treatment or endothermal ablation. Surgery takes around an hour-and-a-half and requires the patient to be given a general anaesthetic. They can usually go home on the same day if all goes well. Less invasive treatment In comparison, heat or laser treatment takes about 60 minutes, the patient is awake throughout and they can normally be discharged from hospital within an hour or so of having the procedure. These treatments are also less invasive than traditional surgery because they require fewer or smaller incisions. 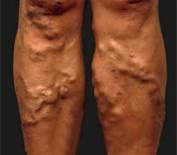 Varicose veins affect mainly older people, but also people who stand for long periods in their work and pregnant women. They can be very uncomfortable and are a common cause of leg ulcers.